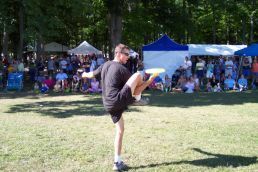 The Flying Aces Pro Frisbee Team offers world-class athletic entertainment for your company picnic, party, trade show, luncheon or any other business event looking for high class, affordable entertainment. Fun and fast-paced, athletic and interactive, the feats, tricks and stunts of The Flying Aces can be adapted to just about any theme or situation. Reliable, self contained, and easy to work with, The Flying Aces can present traditional shows or roaming mini shows, clinics and contests.